Soybean seed isoflavones are affected by various factors, but their responses to phosphorus (P) fertilization is largely unknown. 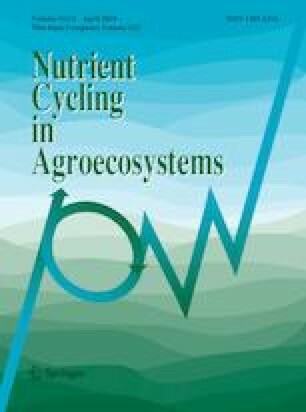 A field experiment was conducted at Jackson and Milan in Tennessee from 2008 to 2010 to investigate the effects of P application rates on concentrations and production of individual and total isoflavone in the form of aglycones in soybean seeds on low and high P soils under no-tillage. Five P application rates (0, 10, 20, 30, and 40 kg P ha−1) plus the University of Tennessee recommended P fertilizer rate based on initial soil-test P were arranged in a randomized complete block design with four replicates. Phosphorus application rates exerted more frequent and greater impacts on aglycone concentrations on the low testing P soil at Milan, particularly under the dry year of 2008. Application of 10–20 kg P ha−1 was adequate for producing high individual and total aglycone concentrations in seeds on the low testing P soil. Genistein concentration was more responsive to P fertilization than daidzein and glycitein concentrations. Individual aglycone concentrations were positively correlated (r = 0.25–0.91) among each other. Total aglycone was positively correlated with seed protein but not with oil in concentration. In conclusion, pre-plant fertilization of 10–20 kg P ha−1 is frequently beneficial for producing high concentrations of individual and total aglycones in soybean seeds on low P soils, particularly under dry years, without any significant reductions in other key quality attributes such as protein or oil. Visit of Xiaohui Wang at University of Tennessee was partially supported by the Innovation Project of Jilin Academy of Agricultural Sciences (CXGC2017ZY011). Funding was provided by Institute of Agriculture, University of Tennessee.